A selection of independent predictors of invasion frequency mapped on the study area of Assyria and surrounding states. From Baudains et al, 2015. 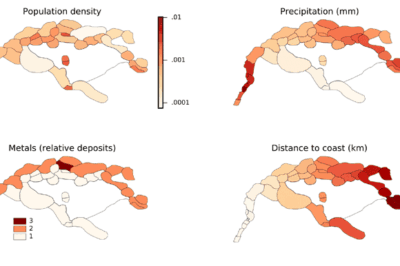 By integrating GIS with proportional hazard modeling, we are now beginning to see GIS increasing its analytical modeling repertoire for the sciences that leverage factors of spatial and time to better understand how emergence and evolution of given processes develops, even when uncertainty is persistent for areas of research. Remote sensing can be used to assess soil moisture across a region. 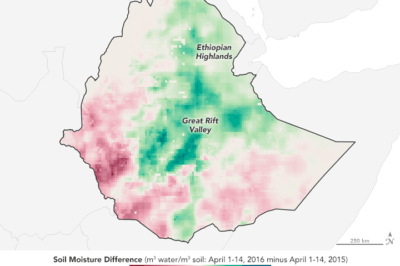 Learn more about two methods NASA has used to map out soil moisture in Ethiopia. 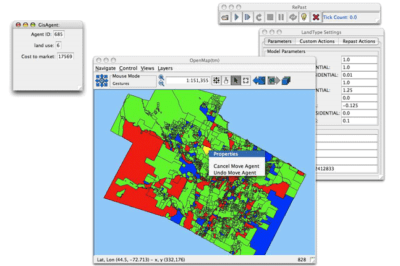 Screenshot from "How to use GIS data with Repast". 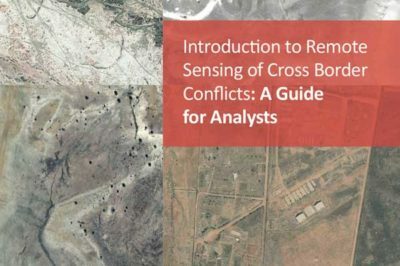 The need to understand emergent phenomenon in a variety of fields has led to not only greater use of agent-based models (ABMs), but we are increasingly seeing tools that integrate GIS with ABMs. 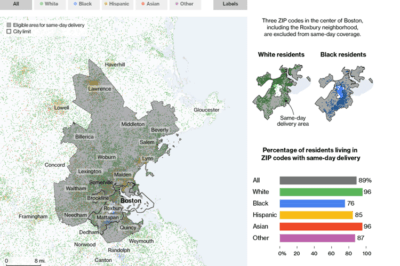 Troy Lambert takes a critical look at Bloomberg’s recent map analysis of Amazon’s delivery areas and racial bias. 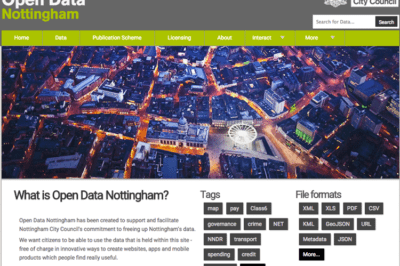 David A. Eagle, Managing Consultant takes a look at how 1Spatial helped Nottingham City Council harness FME in to streamline the availability of open data to the public, reducing its need to spend staff hours on Freedom of Information Act requests. 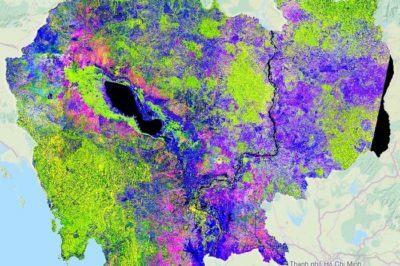 Changes in Cambodia from Sentinel-1A readings at 20 m resolution, acquired every 12 days from March 2015 to March 2016. Dark blue represents water surfaces, light blue to magenta represents agriculture (bare soil and cultivated fields), light to dark green represents forests, and white indicates settlements. In particular, the varying shades of magenta indicate rice sowing and transplanting between mid-September and the end of October. Source: contains modified Copernicus Sentinel data (2015–16)/sarmap/RIICE project/OpenStreetMap contributors (background map). Satellites including Europe’s Sentinel-1A can now track the rise and fall of different agricultural products around the world. The satellite’s imagery showed that rice production in the Mekong Delta has decreased in the past year. 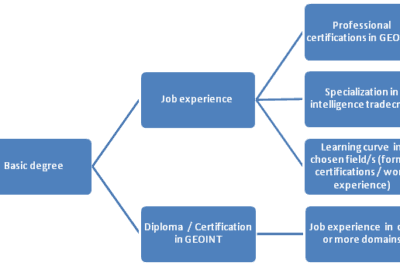 The GEOINT career trail from academics to expertise. Sangeeta Deogawanka discusses what it takes to develop a career in Geointelligence whether it be in security, intelligence, policy analysis, first response, technology, software development or consulting. 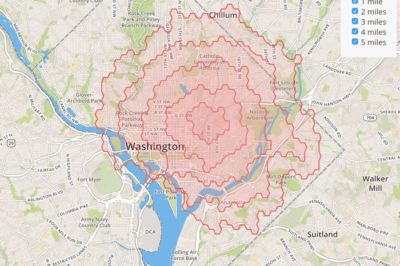 Isodistance measures routes of equal time and isochrone measures routes of equal travel times although both are typically represented as bands of polygons. 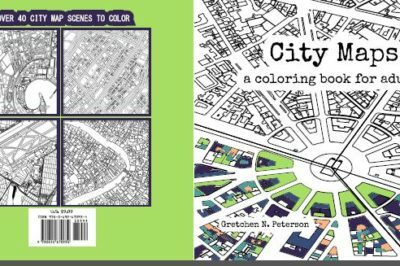 City Maps: A coloring book for adults is a 94-page book containing 44 maps covering cities from around the world.